Do you have gaps in your teeth that you would like to see repaired? Are you looking for a solution to replace some or all of your missing teeth? Are you currently wearing traditional dentures and are looking for something different, and maybe better? We may have the solution you are looking for. There is a marvelous modern procedure that might make you ready to smile with confidence again. You may already be familiar with the problems of traditional dentures. Permanent dentures placed on denture implants are a completely different procedure that can eradicate all the issues you’ve struggled with when wearing traditional dentures. Permanent dentures in Juno Beach are a custom made dental appliance similar to traditional dentures. But whereas traditional dentures are secured onto your gums with adhesive, permanent dentures are secured to dental implants placed into your gums. 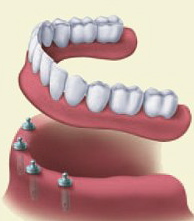 The denture implants keep the permanent dentures in place. Denture implants are small titanium rods placed into the gums and jawbone that within 3-6 months fuse with the jawbone. These denture implants become “new” tooth roots onto which custom made dental crowns are placed. Onto the dental crowns are placed permanent dentures. These permanent dentures in Juno Beach will not come off. What are the advantages of permanent dentures that are secured with dental implants? 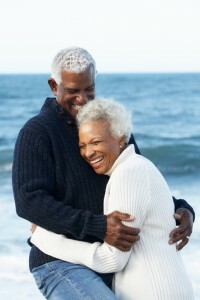 Permanent dentures for the Palm Beach Gardens & Jupiter area will not slip, click or fall out. Permanent dentures are secure because they are connected to dental implants topped with dental crowns. Permanent dentures look like natural teeth because they are custom made to be the right shape and shade as your other teeth. Permanent dentures do not require any special care. Simply brush and floss as you usually do and see your dentist regularly. Permanent dentures on dental implants function like your natural teeth, so chew and eat what you enjoy. Permanent dentures on dental implants give your mouth that full and complete feeling in the Palm Beach Gardens & Jupiter area. The All on 4 procedure gives you teeth in a day! The All on 4 dental implant system in Juno Beach streamlines the system so you can have a full set of teeth in one day. Dr. Brion Weinberg is pleased to offer you All on 4, as well as other dental implant options. The All on 4 procedure has many advantages that we’d love to discuss with you. If you are interested in a solution that can be far more comfortable, natural-looking, more stable and can give you a smile you love, permanent dentures, including All on 4, may be the answer for you. We’d love to give you more information about All on 4 and other permanent dentures options for Palm Beach Gardens, Jupiter & Juno Beach. Call today!